Iration performing in Eugene, Oregon on February 21, 2016. Iration is a reggae group from Santa Barbara, California. All members originally hail from Hawaii. They play a mix of reggae, dub, and rock. The group is one of the leading bands in the genre of sunshine reggae. Iration began in Isla Vista, CA, the small college town connected to UC Santa Barbara, playing reggae covers in college towns such as Cal Poly SLO, Chico State and UC Davis. They recorded an EP, New Roots, in 2006, and built a reputation for their live performance, according to the Santa Barbara Independent: "There's something to be said for any band that can capture the undivided attention of a crowd full of drunken Isla Vistans, especially when there are kegs to be tapped and cops to avoid. But roots reggae rockers Iration manage to 'do it' on a regular basis." In 2007, they recorded and released their first full-length album, No Time for Rest, which topped the Billboard Reggae Albums Chart, and a single, "Cookie Jar", reached number one in Hawaii on 93.9 DaBeat and was featured on Fuel TV’s Triple Crown of Surfing recap. In 2008, Iration embarked on their first national tour, opening for Pepper. On October 3, 2008, Iration released their second EP, Sample This, which debuted as the No. 3 top-selling reggae album world-wide on iTunes. They released their second album, Time Bomb, in March 2010, which also topped the Billboard Reggae Albums Chart and sold over 36,000 copies. In early 2013, after extensive U.S. touring Iration announced they had finished recording a new full length album titled Automatic The album was released in July 2013, sold more than 8,000 copies in its first week of release, and topped the Billboard Reggae Albums Chart. Cage The Elephant guitarist Lincoln Parish is featured on numerous songs, as well as helping produce the upcoming album. 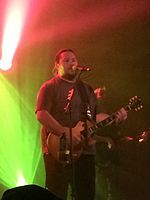 On April 5, 2013, Iration announced that vocalist Kai Rediske had quit the band, leaving Micah Pueschel as the only vocalist/guitarist left in the group. While Iration's official announcement of this via their own website stated Kai left to "pursue other interests", many fans have speculated that the departure was the result of tension within the group due to having two lead vocalists. People that have knowledge of the group dynamic have also stated that Kai's upcoming marriage, and unwillingness to be a part of extensive future touring as a result also played a factor. 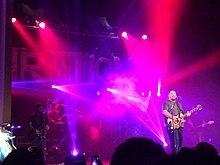 On April 8, 2013, ThePier.org reported Iration has maintained that the upcoming Automatic album and all future shows would not be affected by Kai's departure. The band's fourth album, Hotting Up, just as the first three had, topped the Billboard Reggae Albums chart. ^ Jeffries, David. "Iration – Artist Biography". AllMusic. Retrieved 24 April 2015. ^ "Locals Only Music Issue, Version 2.0". Locals Only. Retrieved 2008-09-18. ^ "Featured Bands Local Issue 2007". Featured Bands. Retrieved 2007-09-27. ^ "Iration - Chart history | Billboard". www.billboard.com. Retrieved 2016-09-27. ^ "Heatseekers Albums: Up and Coming Musicians Chart | Billboard". Billboard. Retrieved 2016-09-27. ^ a b "Iration – Billboard 200". Billboard. Retrieved May 30, 2018. ^ a b "Iration – Reggae Albums". Billboard. Retrieved May 30, 2018. ^ "Iration – Independent Albums". Billboard. Retrieved May 30, 2018. ^ "Porcupine by Iration at ArtistDirect". Caulfield, Keith. Billboard – The International Newsweekly of Music, Video and Home Entertainment125.27 (Jul 20, 2013): 44.